What is Demodex and how serious is it? Demodectic mange (Demodex) is caused by an external parasite that is also present in low numbers on healthy animals. Even people have a human variant that is present in most healthy people. Whether or not a pet shows symptoms of this disease depends primarily on their immune status. It is important to note that the diagnosis of this skin condition, like most skin conditions, cannot be made just by looking at a pet. Diagnostic tests are mandatory to arrive at a correct diagnosis and achieve a satisfactory outcome to therapy. Stating that an animal looks "mangy" is not the same thing as making a positive diagnosis of mange. Pets that have ringworm or sarcoptic mange can look like they have demodex. Demodectic mange is the most common, form of mange in dogs. It is caused by the demodectic mange mite, a parasite which lives in the hair follicles of affected dogs. Under the microscope, this mite appears shaped like an alligator with eight legs. As long as the body's immune system is functioning, these mites cause no harm. Demodectic mange most often occurs when a dog has an immature immune system, allowing the mites to grow rapidly. Therefore, this disease occurs primarily in dogs younger than 12 to 18 months of age. In most cases, as a dog matures, the immune system also matures. Adult dogs which have the disease, usually have defective immune systems. Development of the immune system is under genetic control and there is absolutely no doubt that the tendency to develop generalised demodicosis is inherited. 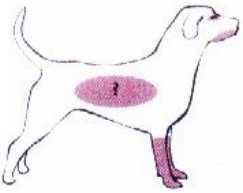 Thus, an affected dog usually comes from a litter containing other affected puppies. Owners of litter mates should be put on the alert to watch for it. Because the disease is due to a genetic defect, affected dog should not be bred from again. Also, parents of the affected dog should not be bred from again. A dog with demodectic mange does not itch severely, even though it loses hair in patches. Areas of bare skin will be seen. The hair loss and inflammation, which is sometimes associated with fine scales, usually circles the eyes and mouth. Fortunately, there is little to no itching and the problem usually spontaneously resolves itself. Generalised demodicosis usually begins with hair loss, scaling and inflammation on the head, legs and trunk. These patches get larger and coalesce. It is common for bacteria, such as Staphylococcus to take advantage of the exposed area and cause mild to extensive hair loss, crusts and inflammation. Bathing with an antibacterial shampoo is the first step in therapy. this loosens the scales, removes oily discharges and decreases the secondary bacterial infection that is usually present. The dog can also receive a special dip or oral medication. For dogs with generalised demodex, secondary skin infections may be present and be a complicating factor which may require antibiotic therapy. Treatment is generally successful but it is important to understand that treatment may take two to three months to be effective. However, if the immune system is defective, neither the mites nor the infection may respond to treatment. In adult dogs, generalised demodicosis is a very serious disease and is usually secondary to an underlying disease process. Both the demodicosis and the underlying disease must be treated. Please consult your vet if you think you dog could have a skin disease such as demodex. It's better to be safe than sorry!